Really putting a crimp in any golf plans. 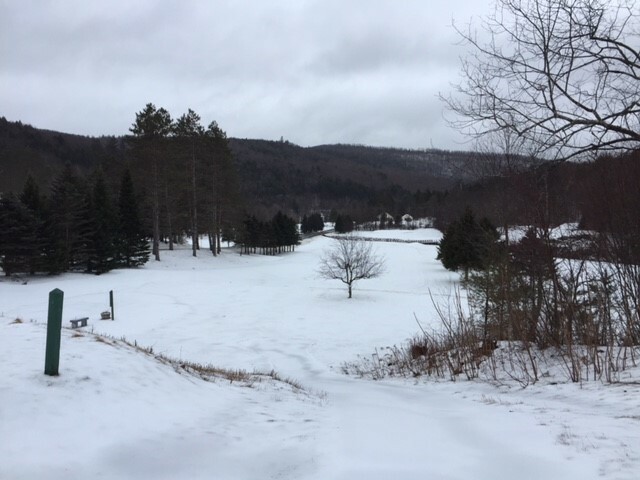 Our fairways were finally starting to clear but with this stuff glued to them and no real big warmups in sight, it may be two more weeks before we open. Yea. BCC's tenative opening was the 15th. Then the 22nd. Then the 27th. Now....I have doubts about that. This ice event was brutal for soil conditions. There is so much water in the soil right now and this week is going to not dry a ounce of that water up. Still just sniffing at the edge of precip - had 0.09" of ZR overnight with a few IP mixed in. Storm total of white: "T". Expect the temp will be about 33 when serious RA arrives. Fun reading about MN/WI/ and the UP - wish they posted more pics. The winds are nearly calm here but gusting to 50-60 mph this morning just 15-20 miles away. Got to love Vermont's microclimates. I took a drive to underhill and Bolton to the western slopes and there were narrow bands of 50-60mph gusts with tree debris and branches down. Literally just a few hundred feet wide at a time. In between it was a non event. Saw a couple healthy pines snapped in half down here on the west slopes..they were pretty thick too, not those tall skinny ones. Wind has really picked up here in the valley now. What a great storm. Even forgetting the fact that it is April 16th. 2" of sleet. Stratus is frozen and sleet overflowed so don't have rainfall total. Temperature is now 33.2F., at 8pm So again CAD really overachieved. All day I was 32.5 to 34F which was my afternoon high. No model had the cold air hanging so long. I had sleet mixed in till 6pm. Temp has really shot up, 37F now. And yet, STILL sleeting. The forecast for the week is awful. Essentially, rain each day, snow each night. Yuck. Proximity to the Green Mountains sure made a difference in temperature. Last night in Brandon, it was 44F degrees at 9 pm. Twenty minutes later and 16 miles to the west in Orwell, it was 37F. Winds in Brandon mixed the air, the absence of wind in Orwell kept the cold air in place at the surface. Pretty neat variations. those ski areas in the greens still open, heckuva upslope couple of days then some synoptic to end the week, Spring! Yes, these types of storms are one of the reasons we like April (and the assortment of both open, but especially closed areas with nice deep snowpack is also a very sweet perk). A deep trough across the North Country will continue to produce occasional valley rain and mountain snow showers through tonight. Some light snow accumulation is likely in the higher elevations as much below normal temperature prevail. A brief break in precipitation is expected on Wednesday with temperatures in the 40s, before another system produces more rain and snow. Some additional snow accumulation is likely in the mountains on Thursday into Friday. As of 917 AM EDT Tuesday...Tonight into Weds...Mid/upper level trof lift toward northern Maine with cyclonic northwest upslope flow developing. This wind trajectory combined with placement of best 1000 to 700mb rh fields support qpf/pops become more trrn focused overnight into early Weds morning. Additional light snow accumulation likely from the northern Dacks into parts of the central and northern Green Mountains, generally above 1500 feet overnight tonight. As of 338 AM EDT Tuesday...An upper level low will push up through the Saint Lawrence Valley and again become firmly established over the North Country. This will lead to more rain and mountain snow showers during the day on Thursday. By Thursday night snow levels should drop to the valley floors and most of the North Country should see some snow with 3-5 inches in the mountains and a dusting in valleys. Just took at cat ride to the top and there is an obscene amount of ice above 2,500ft. There has to be 2" of pure glaze of everything from ropes to chairlifts and trees. Back over to snow though to the valley floor but not Champlain Valley. PF, with the cessation of lift-served season daily snow reports for Mansfield, keep us posted on how accumulations go this week if you get any beta. It sounds like Winter Storm Xanto has put down some bomber base up there (almost exactly 2 inches of liquid equivalent down at my site), the question now is what this week’s snow might do to put something nice down on top of it. There are always the Mt. Mansfield Stake and co-op depth and accumulation reports to follow, but we know how those co-op reports from the engineers can go with their can method. It looks like the snowpack at the stake is at 88 inches as of yesterday afternoon’s report. Passing through the spine via the Winooski Valley this afternoon I could see that snowfall wasn’t really far off the deck, and even down here at 500’ at the house we’ve got some light snow falling. It’s still a bit too warm to accumulate down here, but I can see on the 3,125’ Mid-Mountain Cam at Sugarbush that they’ve picked up roughly 3 inches of snow. I'd say 1-2" on Mansfield today...no reading just an eyeball assessment during hill clean up. It's pure winter though and I think this may be the most snow I've seen in the ground when we close in a decade. Its obscene, glades, all natural snow trails. Nothing even resembling a bare spot on the Mansfield side. The groomers estimate up to 10 feet of snow in spots with snowmaking and I don't disagree. The conditions on the upper half (above the top of the Triple) were terrible though from the ice storm. Below that it softened to really smooth peel away snow from the fresh accumulation on a softening base. It was slow snow but real smooth. Just don't go above 2,500ft. Event totals: 2.2” Snow/2.20” L.E. The snow eventually began to accumulation as the temperatures dropped off, leaving a couple tenths of an inch on the boards. We’re well past two inches of liquid equivalent for this storm now, with a good shot of that still in the dense snow/sleet on the ground. Sb reported 5” last night. Tomorrow night looks promising. I’m so confused about the weekend. Half BCC drains really well. The other half is muck on top of ledge rock. Doesn't drain at all. ALY thinking could be a decent event at 1500ft+ in SVT. Guess I should gas up the truck.